The photograph actually shows the accordion player, James Brown (he can be heard, with many others on Topic TSCD 601 Melodeon Greats). 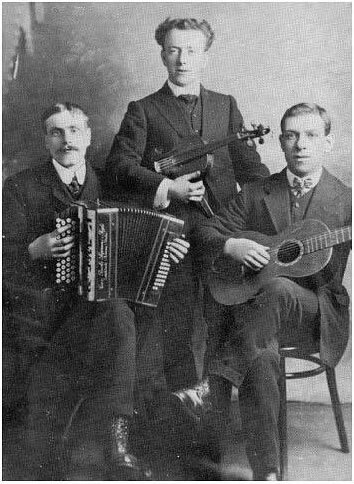 However Rod and the others at Musical Traditions are looking to identify the fiddler and the guitarist; any ideas? If you do. e-mail the folks and let them know, several e-mail addresses can be found at the bottom of this page. Over the past few years the Library has been creating databases of the singers and musicians found by several of the early twentieth century collectors (Sharp, Vaughan Williams, Karpeles, Hammond and Broadwood to date). With the help of Dr Richard Butterworth, a lecturer at the University of Middlesex, we have now put these up on the web as a trial run. We have also created a discussion group to attract comments. Please have a look and see what you think. The site is not complete and the databases still being worked on, but it's a start.